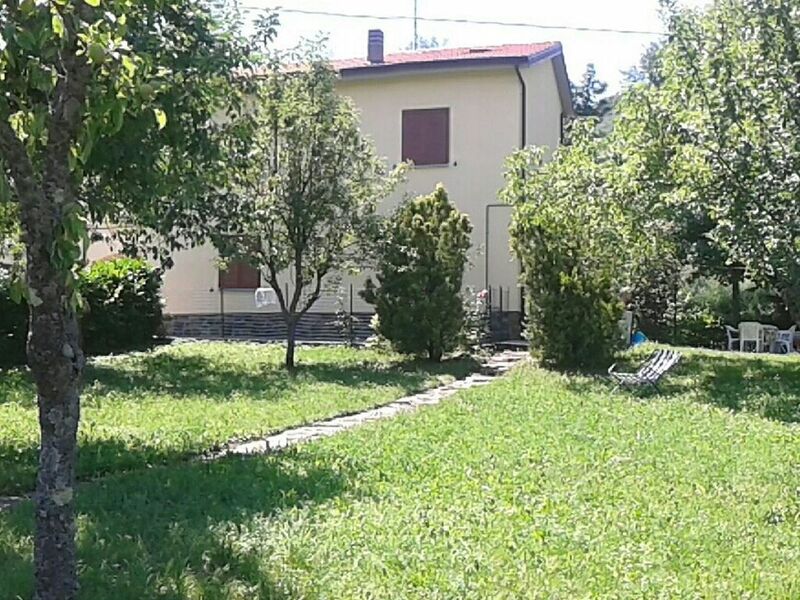 The holiday house is quietly situated in the mountainous landscape of the Tuscan-Emilian Apennines (Bologna province). The nearest town is Porretta Terme. The detached house provides around 95m² of living space spread over two floors. There are two separate bedrooms, a living room, a kitchen and a bathroom with a shower and bidet. The kitchen is fully-equipped, providing everything you need for cooking, as well as a dining table. Both bedrooms have double beds (180 x 210cm) and a supplementary bed (for a child up to 11 years old) can be provided. You can make yourselves comfortable on the sofa in the living room and watch TV or sit together at the round table. The décor is typical of this region. All the rooms have heating. The whole house and the outdoor area have free wireless Internet access. There is a roofed terrace in front of the entrance with an adjoining, fully enclosed garden of around 500m². During the warm season a variety of garden furniture is provided, so you can dine outdoors, relax on the loungers or in the hammock, and enjoy the lovely view of the mountains. A paddling pool is available free of charge for children. About 80 metres from the house there is a car park where you can park free of charge. It is about 800 metres to the nearest grocery shop. The area also offers a range of activities and there is plenty to explore. It is just a ten-minute drive from the house to the Porretta thermal baths, the Rocchetta Mattei castle and the Suviana and Brasimone regional parks with lakes. After booking you receive information material from the owner with valuable tips for exploring this lovely region between the cities of Bologna, Florence and Pistoia. GPS tracks and guided tours for mountain bikes and hiking are also available. In winter you can ski at the nearby Corno alle Scale (up to 2000m). A visit to Bologna (60km) or Florence (65km) is to be recommended at any time of year.